The Alumicolor® Vary Form Curve is a design tool used for fashion design and pattern making and is loved by nearly every graphic designer. 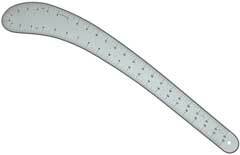 The Vary Form Curve is calibrated on both sides and along both edges to give you even more contours. Dimensions: Varying widths and 0.0460" thick.